The Stained Glass Wool Collection is a wonderful collection of the most beautiful colors for flowers, grass, or anything vibrant. It is so much fun hooking with these colors, it is practically hooking itself. The wools feel wonderfully soft as well. 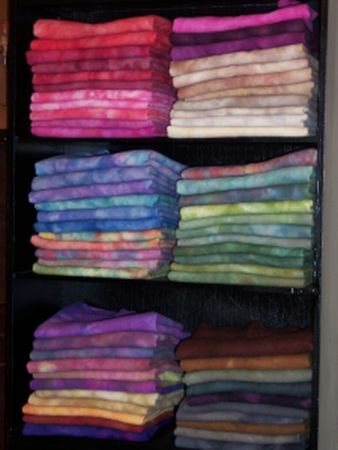 This collection would make a great color base to anyone's stash--whether for rug hooking, quilting, or applique. The Stained Glass Collection consists of 55 Stained Glass Colors and 10 Leading Colors, all in 1/4 yard pieces. See individual colors listed below. A nice warm red. A little lighter than SG#2. Both #1 and #2 would blend nicely together. Sold in 1/8 yard pieces. Another nice warm red. A little darker than SG#1. Again, SG#2 would blend nicely with SG#1. Sold in 1/8 yard pieces. A vibrant cool red. My favorite. It is undescribely beautiful. Sold in 1/8 yard pieces. A nice cool red with hints of violet. Sold in 1/8 yard pieces. A great warm red. Sold in 1/8 yard pieces. A nice rich cool red. Sold in 1/8 yard pieces. Light Blossom Pink. A little darker version of SG#8. Both SG#7 and SG#8 would work well together. Sold in 1/8 yard pieces. Light Blossom Pink. A lighter version of #7. Both #7 and #8 would work well together. Sold in 1/8 yard pieces. Blossom Pink. A nice rich vibrant pink. Sold in 1/8 yard pieces.